Today, we focus on lei making, it’s immediate association with Aloha, and the bona fide importance it has in our island’s culture. For those who visit our islands, it’s the very first thing many see when they arrive at Honolulu International Airport. You’re normally greeted with a lei and a heavy dose of Aloha. It’s the same when leaving the island, and 9 times out of 10, you’re leaving with a smile and sense of tranquility. Aunty Dora is one of the many lei fabricators still stringing together Aloha, and has been for the past 74 years. [FITTED] What is your name, what do you do and how are you preserving our culture? [Dora] Dora, I’m 88 years old and I make leis. I’ve been selling leis since I was 14 at the Aloha Tower; from there we had a lei stand at the Keehi [Lagoon] Park. Then they moved us inside the airport and now we are here. [F] How do you define Aloha, and why does it play such an important role? [D] Aloha means a lot of things, usually Hello, Goodbye and Love. [F] What is your favorite thing about living in Hawaii (restaurants, shopping, bars, recreational activities)? [D] Oh! I’ve been here my whole life! I just stay here at the lei stand now. I like the weather. [F] When you think of Hawaii, what song comes to mind? [F] Do you have any words of wisdom? Allow me to introduce you to Mike Kays, the man behind the Hickam Skate Hanger, avid skateboard collector, VW aficionado and proud father of one of Hawaii’s professional skateboarders Chris Kays. ‘BDK’, as he is known to his friends, has been the driving force in transforming the Hickam Skate Hanger. What was once a place where misfit skateboarders and latch key kids of the late 80′s would skate unsupervised on self made ramps and unusual obstacles is now a world class wooden skate park complete with it’s own pro shop. His passion for skateboarding is to be admired, logging in long hours designing and constructing the bowls and ramps himself. Not for monetary gain, but simply to see the joy it brings other skateboarders. 1. What year did you come on as the official hanger guy and how did that come about? I had to spruce up the ramp before the event and afterwards, HYP offered a part-time job just to do that… ramp maintenance. I was currently active duty military, stationed at Hickam. That pretty much lasted until 2005, when HYP offered the Hangar under a concessionaire agreement in 2006, which is when I then re-vamped the street course, spruced up the bowls, and established a pro-shop. We opened the first weekend in Dec 2006. 2. So the Air Force funds the project; is there a annual budget and how dedicated is the military to skateboarding? You’re correct. Air Force funded, myself and volunteer built. There was always a “supposed” budget; we usually got funding when projects were approved (keyhole & mini-bowl). Since spring 2009, we’ve gotten a quarterly budget that goes to the park. It’s not 100%, but so far, so good! 3. Being that the hanger is located on an Air Force base, what is the process for non-military people to get on base and enjoy the facility, and what are the operating hours? Yes, it’s not as hard as you might think to gain access to the Hickam Skate Hangar (HSH). A simple call or email a day in advance is all that’s required. After that, an option to become a member of the park which would get you (or your parents if under 16) on the skate league list, which provides a 30-day pass each month your membership is current. $20 is the fee for the membership, you get a skatepark ID, HSH T-shirt and reduced $3 day rate ($5 is the non-member rate). Hours of operation: Mon-closed, Tue-Thur 3-8pm, Fri 3-10pm, Sat 2-10pm, Sun 12-5pm. 4. Chris Kays is your son and one of the most talented skateboarders to come out of the islands, what age was he when you realized that he was such a natural? 5. Please tell us little about your skateboard collection, how many and which ones hold the most meaning to yourself? [Pauses] Well I’ve always kept a little something from the past. My starting era was in the mid-late 70′s, so prime time was late 70′s – mid 80′s. I really started the collecting when I got out of active duty service in 2000. Ebay really opened the door to things like skate collecting to those who live far away. From there, communication with other collectors lead to many trades as well. I’m not too sure of the actual count, somewhere around the 200 mark, maybe more in skateboards, quite a bit if trucks, wheels, equipment, accessories and stickers as well. Late 70′s – late 80′s are my fav’s, but for me personally, it was trying to find the boards I used to have, ones I first started (Sims Woodkick, G&S Teamrider, Sims BB (brad bowman), Powell Ray Bones (skull & sword), Sims Folmer, Schmitt Stix Monty Nolder) and the list goes on [laughs] The BB is really my fav, due to it being my first “pig.” Hmmm, pig means wide, when the boards went from skinny to 9 – 10in wide. 6. I noticed a couple of unfinished ramps in the hanger, could you tell us what to expect when construction is complete? 7. You also have passion for VW’s, do you have favorite year or model? Well, I do like the VW buses. Early ones are the best (pre-1968), although I’ve had a number of 70′s, 80′s, and even a Vanagon in the past. For the last 6 years, my daily driver is a 1961 Kombi Bus. It’s set up to drive, not be a garage queen. It’s lowered, upgrades in the engine and suspension, did my own thing inside and out; it’s fun! I do like “baby window” bugs too. I think those are from ’57 and earlier, somewhere around that time frame, but never have I owned one. Early Porsche 914′s and 911 are favs. I think because it’s another German car and has VW roots. I’ve got a ’71 914-6 that’s just coming back to life. Hopefully by February next year (or sooner) it’ll be my alternate daily driver. See the best of both worlds behind the wheel (evil grin). 8. Tell us about the your shop boards (BDK model) and where you got the inspiration for the graphic. It’s something I wanted to do for a while. Just got them out this year. The first graphic definitely had to be military related; after all, what’s more fitting? HSH is on an AFB, I was in aviation in the service as well as now as a civilian, so I’m into WWI and WWII planes. The P-40 Warhawk was the basis for the design. It’s an aircraft that was here during the Pearl Harbor attack. The “Flying Tigers” was in the company inspiration. I doodle quite a bit in graphics on the side, so I drew up the design and did some magic with Photoshop & Illustrator to help me manipulate what I wanted. So far, I think it was a success, plus I really don’t go for the “selling blanks,” even our shop board compares close to price, we just include griptape. 9. Who are your favorite pros to watch besides your son? Back in my day: Tom Inouye, Tony Alva, Brad Bowman, Duane Peters, Allen Losi, Neil Blender, “Gator” Rogowski, Lance Mountain, & John Gibson. MESS crew ’83-85 (Mid-Eastern Skateboard Series): Tom Groholski, Jeff Kendall, Bill Danforth, Ray Underhill, & Britt Parrott who inspired my to this day. Now-a-days: Sandro Dias, Danny Mayer on vert caught my eye recently. Props to vert / pool icons Tony Hawk, Christian Hosoi, Steve Caballero, Steve Alba, Chris Miller. Way too many dudes in street over the years, but recently, Greg Lutzka impressed me (for what that’s worth), and of course you have to give props to some of the icons who started and / or still skating street: Mark Gonzales, Rodney Mullen, Frankie Hill, Eric Koston, & Jamie Thomas to name a few. 10. Knowing that you also have a day job on top of all your responsibilities to the hanger, to the shop, to your family, what keeps you going? You know, that’s a good question! Life in general. Everything about it, family, work, hobbies, friends, take it all in. The good and the bad, experience it, and it’s not really a bad deal (although it’s what you make of it). Skateboarding has definitely been an influence to me personally since I was 13. I lived through the pages of Thrasher, TWS during the beginnings (my era) and filled my passion with the reality of skateboarding, ramp building, park designing, meeting skaters from abroad, meeting pros from “back in the day” and seeing the new breed of kids everyday enjoy what I’ve always enjoyed…… skateboarding. Chef Lindsey Ozawa is like any other artist – his creativity can be stifled under the constraints of a corporation. So when the culinary artist recently parted ways with his former employer, Fitted was happy to see that Lindsey’s cuisine creativity could flow freely into a fresh concept. Just look at how the chef played a big influence in the creation of the V-Lounge pizza. When Lindsey is not confined to a particular genre of food he can let his culinary artistry loose. 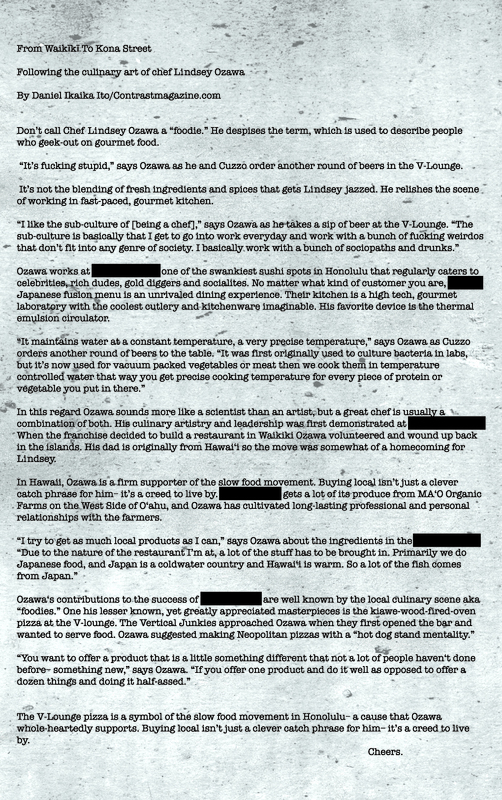 The following story was written before Ozawa stopped working for the fancy-pancy, expensive restaurant that will remain nameless throughout the text. In fact, we had to go through the story and block out each time the aforementioned eatery was mentioned. So here is the story of a chef that is way too gangster to ever be called a foodie.